Rewriting in the Web of Data. The SPARQL-RW (SPARQL-ReWriting) Framework provides transparent query access over mapped RDF datasets in the Web of Linked Data. The SPARQL-RW Framework provides a method for SPARQL query rewriting, with respect to a set of predefined mappings between ontology schemas. are supported by the SPARQL-RW Framework. [07|2013] Like SPARQL2XQuery on Facebook! #SPARQL2XQuery #Facebook. Mapping Specification between Ontologies Schemas. SPARQL Query ReWriting based on Mappings. Inference Support over SPARQL ReWriting. Makris K., Gioldasis N., Bikakis N., Christodoulakis S.: "SPARQL Rewriting for Query Mediation over Mapped Ontologies". Technical Report 2010. Makris K., Gioldasis N., Bikakis N., Christodoulakis S.: "Ontology Mapping and SPARQL Rewriting for Querying Federated RDF Data Sources". 9th International Conference on Ontologies, DataBases, and Applications of Semantics (ODBASE'10). Makris K., Bikakis N., Gioldasis N., Tsinaraki C., Christodoulakis S.: "Towards a Mediator based on OWL and SPARQL". 2nd World Summit on the Knowledge Society (WSKS '09). SPARQL2ΧQuery. 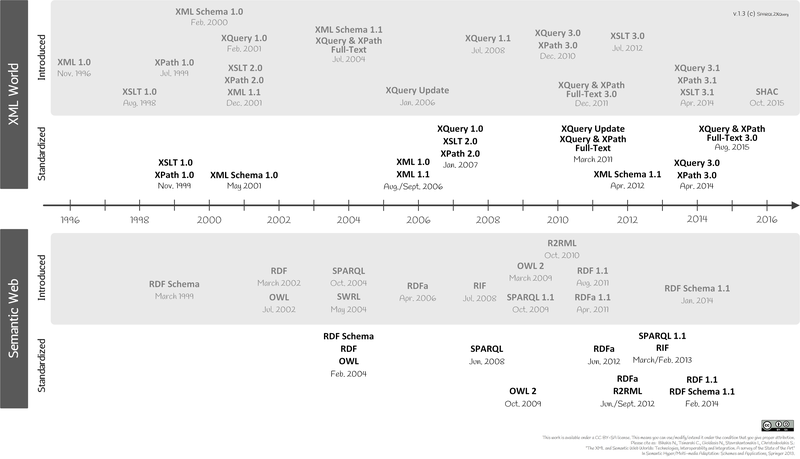 Bridging the gap between the XML and the Semantic Web. © 2009-2011 · sparql-rw project. Bikakis N., Tsinaraki C., Gioldasis N., Stavrakantonakis I., Christodoulakis S.:The XML and Semantic Web Worlds: Technologies, Interoperability and Integration. A survey of the State of the Art". Semantic Hyper/Multi-media Adaptation: Schemes and Applications, Springer 2012.